What is Business Motivation Model (BMM)? Current: What is Business Motivation Model (BMM)? To capture decisions about reaction to change and the rationale for making them, with the intent of making them shareable, increasing clarity and improving decision-making by learning from experience. To reference the outcomes of the decisions to their effect on the operational business (e.g. changes made to business processes and organization responsibilities), providing traceability from influencer to operational change. The specification assumes that an enterprise BMM will stand alone, connected to the relevant parts of the operational business by 'placeholders' - text references1 , which might include URIs. The scope of an enterprise BMM may be the entire enterprise, or an organization unit within it. Higher-level organization units may appear to lower level units as influencing organizations, outside the 'enterprise' boundary, and their directives may have the status of regulations. An enterprise BMM does not have to represent the entire enterprise. A stakeholder can create a BMM of a partial view, referencing only those parts of the business that are relevant to his/her responsibilities and decision-making authority. Vision (optional): an easily-understood summary of what the enterprise considers itself to be, or aspires to be. 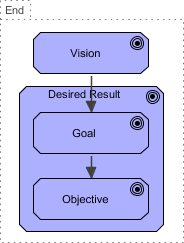 All objectives and goals should support (or, at least, not contradict) the vision. Goal: an enterprise state or condition to be maintained or approached in the medium to long term, e.g. "To be one of the top three suppliers (by turnover) in our market". Objective: a measurable, time-targeted step towards one or more goals, e.g. "To increase year-on-year turnover by 2% in the current financial year". Required or expected values of key performance indicators are recorded as objectives, although not all objectives are based on key performance indicators. Desired results are supported by whatever progress management system the enterprise has. The BMM entry for a desired result includes references to the detail that supports it, rather than containing the detail itself. Mission (optional): the enterprise's primary activity. How it is carried out is defined in its courses of action. Strategy: a major part of the plan to accomplish the mission, usually long-term and with a significant impact on how the business operates, e.g. "Focus on repeat business from corporate customers"
Tactic: a course of action that supports one or more strategies - narrower in scope than a strategy and may be short-term. For example, "Provide personal incentives for corporate bookings". There is no hard and fast distinction between strategy and tactic; it will vary from enterprise to enterprise. A BMM entry for a course of action provides a summary description of the course of action, plus references to the detail of the operational business - business processes, responsibilities assigned to organization roles, deployment of assets and resources, etc. - where the course of action is realized. Business policy: a broad directive that needs further interpretation (in business rules) in order to be put into practice, e.g. "Loans must be repayable". Business policies may be documented in an enterprise BMM, or in a separate policy management system. Business rule: reference to a rule in the operational business, e.g. "A home mortgage must not be for more than 4 x the borrower's salary". Business rules make business policies practicable, and guide business processes. 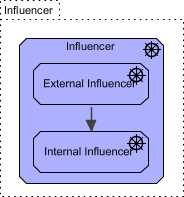 Internal Influencer: from within the enterprise (e.g. resource quality, infrastructure, habit). External Influencer: from outside the enterprise (e.g. customer, regulation, competition). Influencers may (or may not) originate from recognized influencing organizations, such as regulators or competitors. When an influencer causes a significant change, the enterprise makes an assessment of its impact, identifying risks and potential rewards. There may be multiple assessments, perhaps from different stakeholders. Assessments take account of relevant earlier assessments and decisions recorded in the BMM, and of other influencers related to the one causing the change. 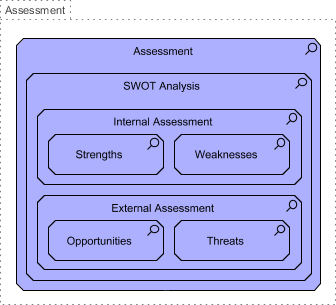 Assessments are supported by whatever business intelligence and risk analysis systems the enterprise has; the BMM entry for an assessment includes references to the detail that supports it - reports, studies, simulations, etc. - rather than containing the detail itself. The outcomes of an assessment are decisions about ends and means. Package diagram is UML structure diagram which shows packages and dependencies between the packages. 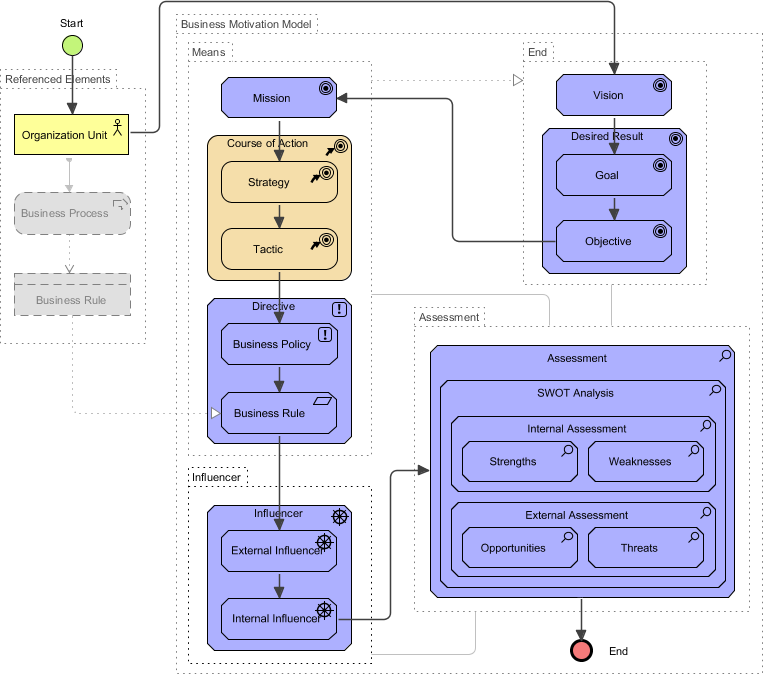 Model diagrams allow to show different views of a system, for example, as multi-layered (aka multi-tiered) application - multi-layered application model. Decisions are represented in Ends (which define what the enterprise has decided it wants to be) and Means (which define what the enterprise has decided it needs to do in order to achieve its ends). Influencers, assessments, and changes to ends and means are recorded in the enterprise's BMM. Entries for ends and means include references to those parts of the operational business that are affected.